A total of 13 nations competed, and with 11 chasing points towards the Furusiyya FEI Nations Cup™ Jumping 2015 Final in Barcelona, Spain in September it was never going to be an easy one to win. 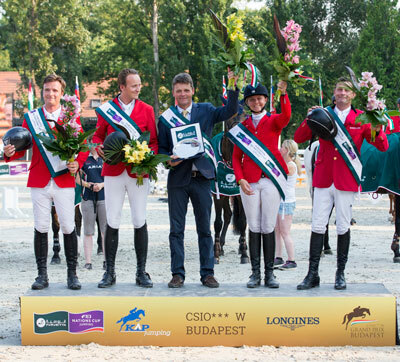 A brilliant double-clear – one of seven on the day – from second-line rider Rikke Haastrup with Qualico du Bobois, helped anchor Danish chances however and secured the country’s first-ever Nations Cup victory at the historic Hungarian venue. The Hungarians lost their grip on the lead with 16 to add second time out to finish on 20, while the Italians added 12 despite a double-clear from Giovanni Lucchetti (Bella Strade) to bring them on to 16. And the Austrians were unfortunate when they were the only country to produce two double-clears on the day – from Roland Englbrecht (Mevisto’s Poorboy) and Max Kuhner (Coeur de Lion) – but obliged to add 13 second-round faults collected by Dieter Kofler (Emir v. Moleneind) when Astrid Kneifel bravely racked up 16 on her second tour of the track, rolling their scoreline onto 18. The Czechs on the other hand were improving all the time despite the second elimination for Augier de Moussac, adding just eight to finish on 16 faults alongside the Italians. After today’s winning result, which has promoted Denmark to the top of the Europe Division 2 leaderboard, Chef d’Equipe Lars Pedersen is looking into the future with renewed excitement. “We now have two goals ahead of us” he said this evening, “the Furusiyya 2015 Final and the European Championships at Aachen – we have to find our very best team for these. And we definitely plan to come back to Budapest next year!” he concluded.